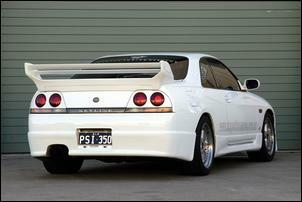 One of Australia's best R33 Nissan Skylines. Whatever happened to people who take their cars off the road for months at a time to build them from the ground up? It seems that it’s all too easy to buy a late-model performance machine and slap on some bolt-on goodies in dribs and drabs. Well, that’s not Brendan X’s approach - he likes to do things properly. 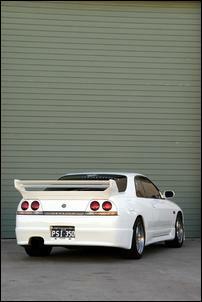 And just look at his magnificent R33 Skyline - its unquestionably one of the best in the country. Brendan is the proprietor a Queensland motorcycle sales/service business (MTM Motorcycles) and has owned some pretty quick machines; a GSXR1000 with upgraded suspension, performance exhaust and tune is something sure to get your heart pumping! 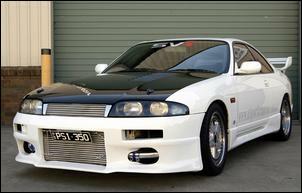 But his latest 4 wheeled beast is this R33 Skyline. Brendan says he’d always wanted a R33 since he first laid eyes on one. Unfortunately, insurance issues meant he couldn’t buy one until late ’03. When it arrived in Brendan’s hands, this R33 was a near-stocker in good condition. The only mods were an exhaust, a small ARC replacement intercooler and aftermarket replacement brake rotors. However, Brendan was soon forced to upgrade the clutch and switch to an A’PEXi Power FC computer - and this is how he drove it for a couple of months. Then it was time to get serious. Over the following 8 months the car received a major upgrade of the engine, suspension, brakes, body and interior. Brendan removed the stock engine and sent it off to a reputable engine builder – Ferrari specialist, Tony Fisano. The RB25DET straight-six was treated to a full cryogenic treatment, Aries forged pistons, ARP stud kit, ported head, Tommei camshafts, HKS adjustable sprockets and valve springs, larger valves, upgrade retainers and a Tommei head gasket. This formed the ideal platform for running some serious turbo-ware. Clinging to the side of the DOHC is a modified Garrett GT35 roller-bearing turbocharger and an 80mm Teal external wastegate. 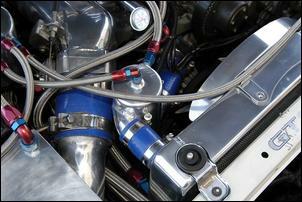 Both are located by a beautiful Mike Vine fabricated exhaust manifold. Gasses flow through a custom 3 ½ inch mandrel system featuring a XTR heat bag and heat wrap to contain temperature to the cat converter. Out back, an Edelbrock Nascar muffler does an excellent job keeping the engine quiet. Boost pressures of up to 30 psi are punched through a custom ARE front-mount intercooler that’s a massive 5 inches thick. Brendan has also added a custom C02 spray system for the intercooler – there’s a tank in the boot, a nitrous solenoid at front of the car and a pair of brass nozzles aimed at the core. 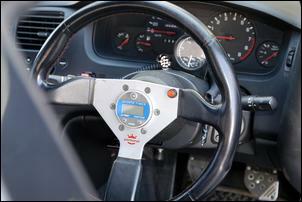 The system is armed by a master switch on the dash and a trigger button on the steering wheel. 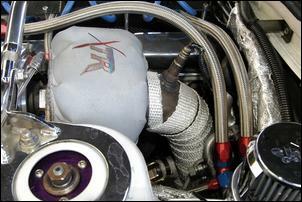 The intake to the turbo comprises a large K&N pod filter inside a custom carbon fibre moulded airbox. You may notice the intake arrangement is completely different to stock. A GReddy intake manifold relocates the throttle so a neater pipework route can be used with the upgrade front-mount intercooler. The throttle has also been upgraded to a big-bore aftermarket job. Controlling fuel delivery and ignition timing is a MoTeC M800 programmable system, expertly fitted and tuned by All Star Tuning. Low impedance 720cc Tommei injectors spray fuel into the chambers while a SX regulator, custom rail and Speedpro lines can also be found under the lid. 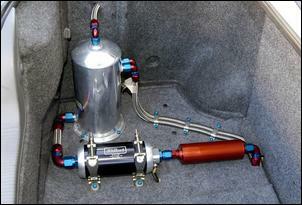 The boot is fitted with a surge tank, Edelbrock 80 gph pump and SX filter. The ignition side of things incorporates Haltech direct-dire coils and a MSD booster. 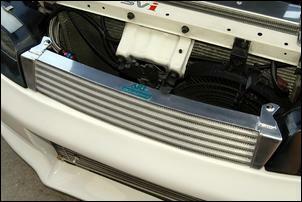 It takes only a quick glance at the engine bay to appreciate its level of detail. Much of the thanks for this goes to ARE – they’re responsible for custom radiator, overflow and filler tanks, polishing and some of the braided lines (Brendan did the rest). There’s also a fantastic 3-in-1 oil/air separator, radiator header tank and washer tank. But surely the piece de resistance is the oil cooler – check out the way it’s been integrated between the headlights to mimic a grille. This is one spectacularly innovative and professional job! And it doesn’t end with the metalwork. Don’t overlook the carbon fibre inlay between the valve covers and the elegant stand-offs for the ignition coils. Very nice. 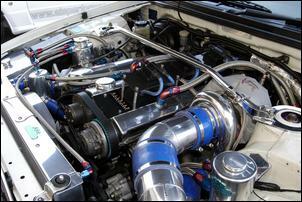 Although it looks beautiful, this RB25DET is not just for show. Unfortunately, an accurate chassis dyno figure can’t be recorded because when it whips past 400kW at the wheels there’s no way of preventing tyre slippage... Brendan’s guess is around 420 – 430kW at the wheels! A twin-plate clutch from Direct Clutch, Cusco LSD and short shift are the only necessary mods to the driveline. With almost 1.5 tonnes of Nissan Skyline hurtling down the bitumen it’s no surprise upgraded brakes are essential. Brendan’s car flaunts a 360mm/4 pot brake combo from CSC Engineering in Melbourne. The rear brakes remain stock except for the aftermarket discs that were fitted in Japan. And suspension? HKS adjustable suspension can be found at each corner; note that these have been re-valved to provide more suitable ride characteristics. The alignment has also been ‘sportied up’ using Cusco adjustable arms front and rear. A polished front tower bar improves front-end rigidity. Brendan didn’t want to spoil the shape that he loves, so he paid close attention to body add-ons. The bumper bar is an aftermarket lower section blended into the original unit, the Japanese rear spoiler has been extensively modified and the not-too-chunky side skirts were purchased from local body kit supplier SVi. 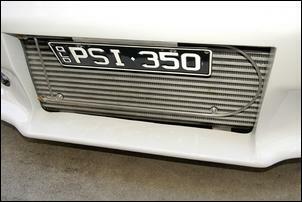 The bonnet is also a beauty – unpainted carbon fibre with hot air vents and a pair of bonnet pins. Wheels are 17 inch Japanese items wearing 255 and 235mm tyres – sticky Bridgestone RE55s are used for Brendan’s track appearances. 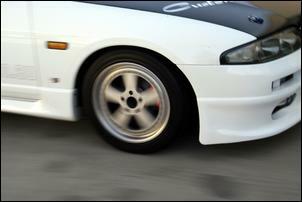 Note that these wheels were the only 17 inchers Brendan could fit over the big front brakes. Amazingly, after just a few months with the car back on the road, Brendan has already shifted his attention to another go-fast project. The next vehicle will be significantly lighter – and, yes, it will have more than 2 wheels. That’s all we’re supposed to say on the matter – you’ll have to stay tuned! Brendan would like to thank All Star Tuning, Tony Fisano and ARE.